Knowledge Base/General/Tutorials/How to update page/post status & visibility? Go to: Page or Post on left navigation. Click on specific Page or Post title to edit. Publish Block shown at right sidebar. 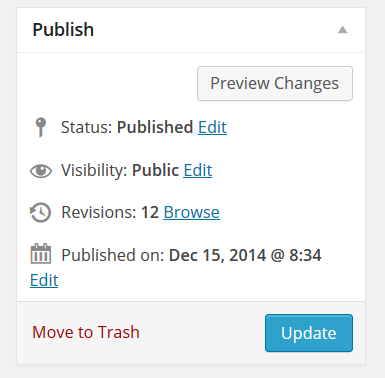 The Status area of the Publish module shows the state of the Post. Published – The Page has been published on your blog for everyone to see. Scheduled – When the Page’s timestamp is set in the future for automatic publishing, you can schedule Pages for the future on your blog. When the time and date comes around, the Page will automatically be published to the blog. Pending Review – The Page has been submitted by a Contributor. It must be published by an Editor or Administrator before it is visible to blog readers. Draft – An unpublished Page, the Page will not be visible to readers until the Page is published. The Visibility area of the Publish module is used to set who can read the Page. Protected – The Page is protected with a password you set. Any User that has the password can view a protected Page. Private – Pages are only visible to website Editors and Administrators. Private Pages are not visible in Blog Surfer, feeds, or in any search. A Page can be private without being password protected.